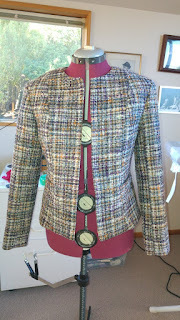 I am about to start a wool overcoat for my husband. 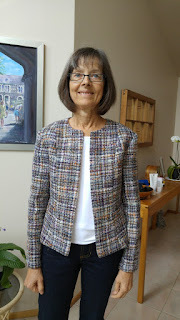 In anticipation of this, I took the Expert Sewing Techniques for Jackets online course by Sarah Veblen, Essential Guide to Tailoring (both the Structure and Shape and the Construction classes) by Alison Smith, and I decided to sew myself a basic tailored jacket first. I highly recommend the classes, especially the one on structure and shape. 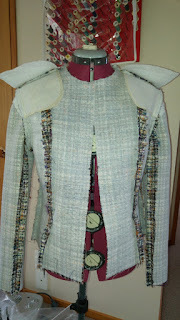 This turned out to be the best fitting jacket I have ever made. 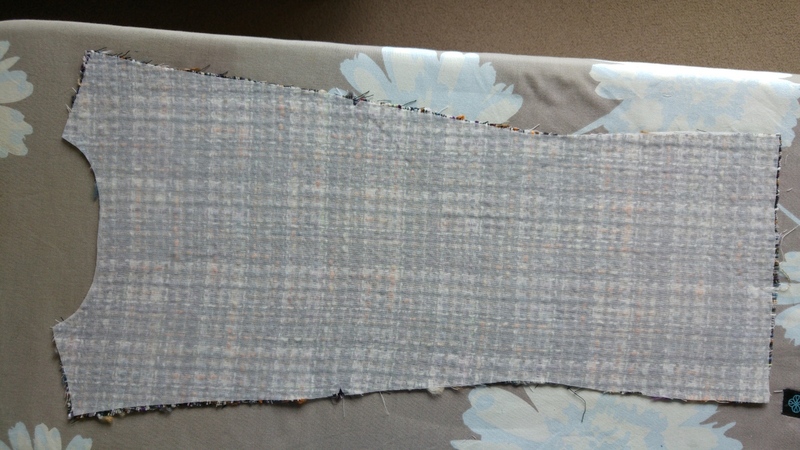 Loose weave Italian wool plaid 1.7m of 154cm wide; bought in Brisbane Australia at Beth-Wyne Couture Fabrics. 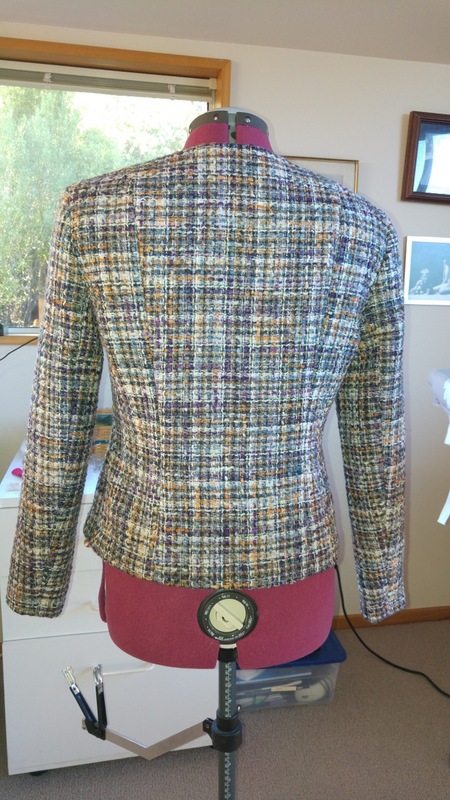 I used the Vogue 7975 jacket pattern View B Size 12 but with welt pockets - very basic with no collar and no buttons. 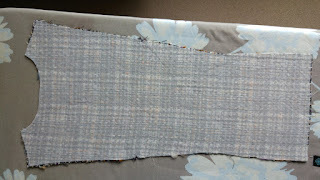 I first made a muslin with broadcloth. Based on that, I shortened the bodice by 1/2 inch, reduced the breast point by 1/4 inch, took in the bottom edge 1/4 inch on the back side of the side front and both sides of the back and side back. 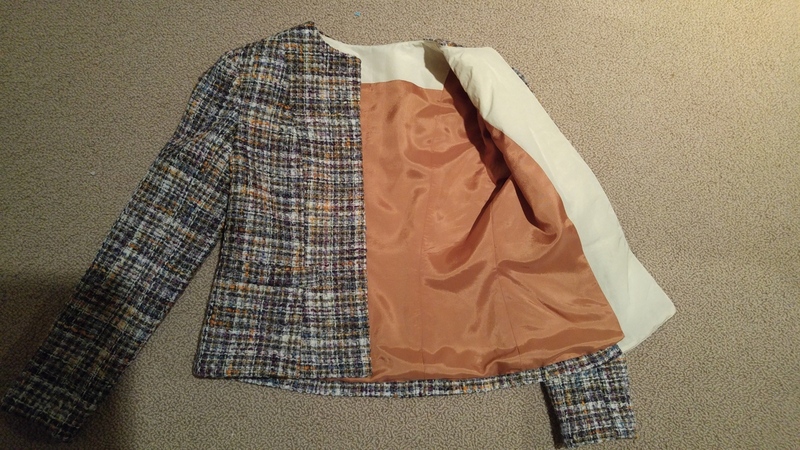 I cut out the pieces on a single layer so that I could line up the plaid perfectly. The fabric was super ravelly so I interlined all the pieces with fusible interfacing (see above for details). Here's the interlined back piece. I used Alison Smith's Speed Tailoring method for the canvas attaching it with fusible interfacing at the armscye and shoulder. I didn't use any tape (forgot - oops!). 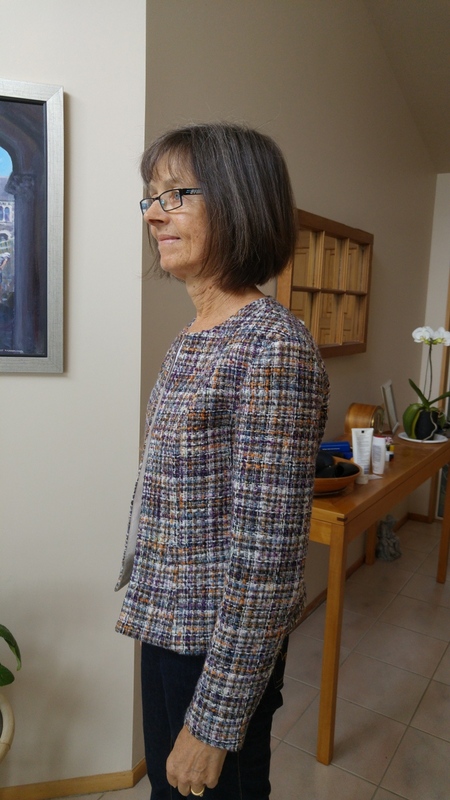 I made the sleeve head from domette and attached it using Alison Smith's method, tracing it off the sleeve pattern and attaching the top edge with an ease stitch. I then using a herringbone stitch to secure the bottom edge. After inserting the sleeves into the jacket, I attached the shoulder pads after first moulding them over a ham - see how they are sticking up like wings with the jacket inside out? As they were so thin, I didn't add anything to the front and back pattern pieces and it turned out fine. 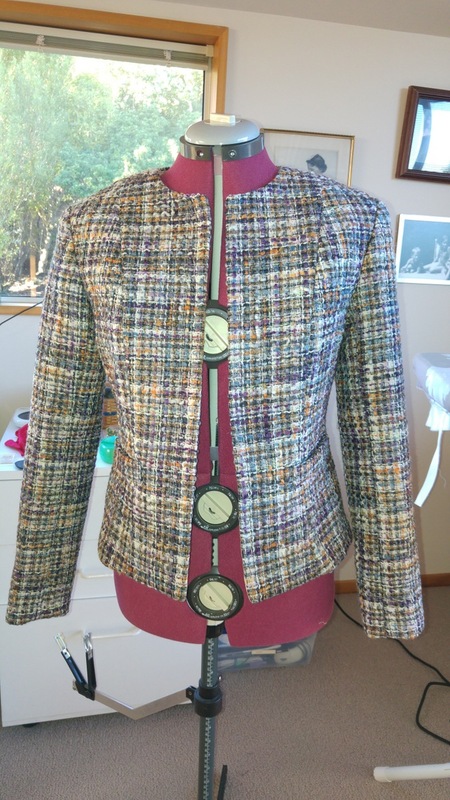 I used Sarah Veblen's method of attaching the shoulder pads - rather loose tacking stitch at shoulder seam at neck and about 1 1/4 inches of herringbone stitch at the arm edge. 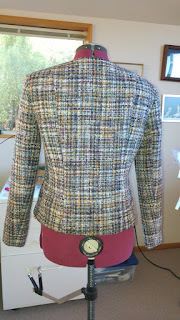 When attaching the jacket to the lining/facing, I used Sarah Veblen's method of doing corners. You don't turn corners during a seam but sew right off the edge and start again. Then you go back and reinforce the seam starting 1-2 inches before the corner, going down to a small stitch length (I used 1.2mm) before the corner and then cutting across the corner at a 45-degree angle very close to the actual corner, and then continue for another 1-2 inches using a longer stitch. This pattern did not have you attach the sleeve lining to the rest of the lining before inserting it, which is what I have done in the past. Instead, I basted the armscye edges all together (lining and main fabric) just inside the seam allowance using a firm stitch and knotting it at each end. Then I pressed the sleeve lining armhole along the seam allowance, slid it onto the sleeve and sewed it to the lining armscye. I really liked this method as it holds everything more securely and I didn't have to tack the lining to the fabric anywhere. Because the fabric was so ravelly, I did a Hong Kong finish on all the hems using silk organza just to be safe. 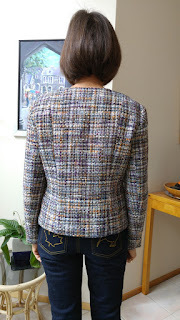 Then I sewed the hem using a herringbone stitch. Then I folded the lining at just the right place so it would droop over just a little when it was finished and sewed it to the silk organza where it met the fabric using an invisible stitch. 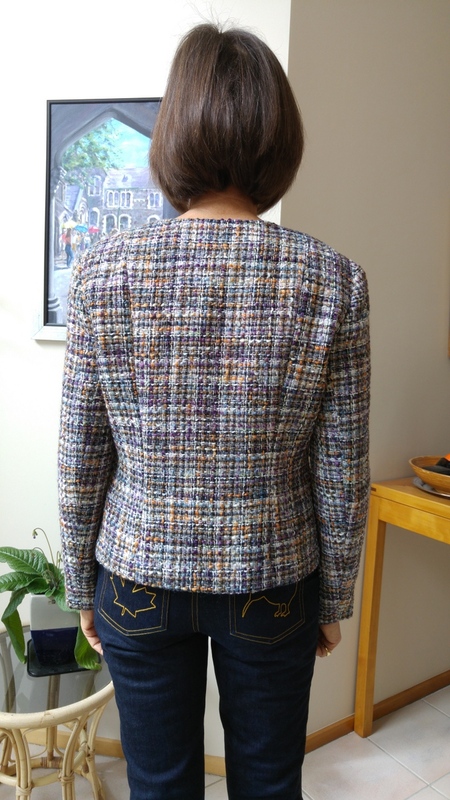 And with no buttons or buttonholes to do, I was finished! It fits perfectly although I haven't taken a picture of it on me yet. Update: Photos wearing the jacket.